If the client desires a water-based heating system, this is a good situation to argue for a solar combi-system. It provides flexibility and there are many interesting system designs on the market, varying by region and the locally used auxiliary energy sources (Weiss, 2003). 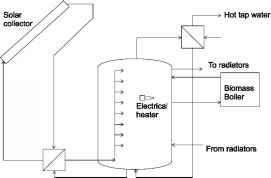 The storage tank can serve both the DHW and the space heating system, and it can be heated by both the auxiliary and the solar systems, depending on conditions. 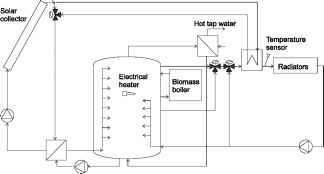 The system illustrated in Figure 2.5.1 uses a wood pellet boiler and an electric resistance heater as auxiliary energy sources to back up the solar circuit. It is equipped with a device to enhance thermal stratification in the tank. The DHW is heated in an external heat exchanger. A critical design condition is the case of minimum heat demand by maximum solar gains, as often occurs in summer. To minimize the system overheating in such instances, the solar system should be dimensioned to just cover the summer energy demand, accepting a small solar coverage in winter. Nonetheless, an important advantage is that the combustion backup heating can be shut down during the summer. As a result, short cycling of the back-up system in summer can be eliminated, increasing the life expectancy of the system. The shorter heating season of a highperformance house results in a more pronounced seasonal mismatch between solar gains and space heating demand than is the case for conventional houses. This is illustrated in Figure 2.5.2, with the case of a reference apartment building in the cold (Stockholm) climate. The DHW demand is here assumed constant over the year, although it is often slightly lower in summer - for example, due to vacations. The overheating problem could be reduced by installing a larger storage tank than the system design would otherwise require. 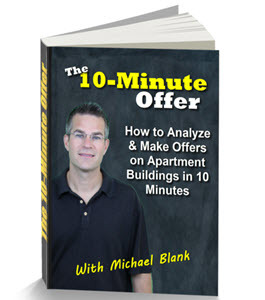 However, this approach is expensive, takes up more house volume and leads to higher tank heat losses. There are also good control solutions available - for example, using partial evaporation to empty the collector during stagnation. Active removal of energy transported via the steam during stagnation is also possible with a small volume heat sink. Alternatively, the tank can be cooled down by circulating the heat transfer medium through the collectors at night or by using an air cooler (Hausner and Fink, 2002; Weiss, 2003). However, the more cautious design strategy is to not over-dimension the collector area. An advantage of a combi-system is that during the heating season, when energy for space heating is withdrawn from the tank, the operating temperature in the collectors can be lowered, increasing the collector efficiency. This typically occurs in autumn and spring. This gain in efficiency can be maximized if the solar collectors supply heat directly to low temperature surface heating, as shown in Figure 2.5.3. This requires a good control strategy. Such systems are common in France, Denmark and Germany (Weiss, 2003). A larger collector area is possible without risking overheating if the collector tilt angle is increased in relation to the optimal tilt angle, which approximately lies between 35° in southern latitudes (latitudes around 45°) and 50° in northern latitudes (latitudes around 60°). 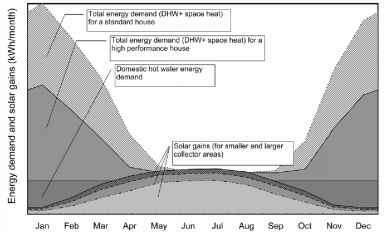 The suitable collector area to cover 95 per cent of the summer hot water heating demand with minimal system overheating is illustrated in Figure 2.5.5. The results are from Polysun simulations of a flat-plate combi-system coupled to an apartment building in the cold climate. One way to better balance the solar gains to the heating demand is to mount the collectors vertically on the façade or to mount them with a high tilt. This positioning makes better use of low winter sun angles and suppresses summer overheating. This results in a more even distribution of solar gains over the year; but a larger collector area is required to cover the summer domestic hot water demand. 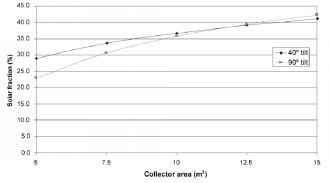 Figure 2.5.4 shows how the solar fraction increases with increased collector area for collectors tilted 40° and 90°. The results are from Polysun simulations of a flat-plate combi-system coupled to a single family house in the cold climate. Where houses are closely spaced, a micro-heating grid with a central solar system may be plausible. Collectors on the houses then can share a large semi-seasonal solar storage tank enabling some summer solar gain excess to be stored for the autumn. The large tank volume has an advantageous surface-to-volume ratio reducing tank heat loss. A shared system can also even out peak demands or supply excesses. Disadvantages are the relatively high heat losses of the pipe grid relative to the very small space heating demand, and the investment and administrative costs for meeting such a small demand. Such micro-heat distribution grids for row houses have proven effective in demonstration projects in Germany (Russ, 2005).